Thank you, thank you, THANK YOU!!! Buffalo, you've been great this season. I really appreciate everyone who came out to both Women's Gifts and the Queen City Market this year to support local artisans. Both shows were my best yet. I am really happy. The monsters are happy too. I'm excited to get some feedback. It's a learning experience and I don't have all my products listed yet. Let me know what you think. I have one more event in Buffalo before Christmas. This Friday [December 19th] I'll be at the Larking Building from 10am to 2pm. I'll have a ton of ornaments and cards and of course MONSTERS! :) Stop by if you can! I Now Pronounce you Monster and Wife. The week after a big show is always weird. Part of me wants to take a break and relax. I've been knitting pretty much nonstop for the past few weeks and it would be good to give my fingers a break. 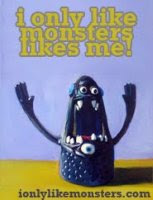 The other part of me, however, realizes that a lot of monsters found new homes this weekend [YAY! Thank you!] and I gotta work to restock for the next show. So, I don't know what to do and have been having disorganized, partially productive days. These two ornaments were a custom order. They are wedding gifts for a couple who are getting married this fall. The color scheme for the monsters was built around the school colors of the university where they met. I considered giving the bride a veil and bouquet, but decided it was bit much for a small ornament and instead opted instead for a little felt flower with a pearl button center. Perhaps if I make a larger monster bride and groom set I'll give them more accessories. Add these guys to the list of fun "ERIN MAKES STUFF" ideas for weddings! Remember the Ring Bearer Monster from my friend's wedding? And Name Designs always make great gifts too! Besides the wedding monsters, I also finished the monstapus I was knitting this weekend at the the festival. It's nice that I can get a little work done while I'm at a show... a lot of artists can't do that! I'm lucky that knitting is portable. I love how this guy turned out. I haven't made a monstapus in awhile! Now to get some more work done... What would you all like to see at the next show? Let me know in the comments! This event was so overwhelmingly great that I can't think of what I even want to say about it. So I'm just going to include this link to the news coverage of the event and share some pictures and other people's words here. Thank you so much to everyone who came out. It was great to reunite with old friends. Bill Sheehan and his Denver, CO family celebrated Billapalooza with everyone. His daughters were able to use FaceTime to show Mr. Sheehan all the love, support and music that was happening in his honor. Thank you to everyone who stopped by Mayday! Underground Craft + Art this past weekend! Here are a couple shots of my booth setup. Sorry they're dark and a little blurry. I forgot my Nikon and had to rely on the iPhone. It was a really fun show and I was super happy to be a part of it. Lots of monsters found new homes. I have such great, enthusiastic, fun customers and I appreciate you all so much! Without you, I couldn't do what I do. You're all great! Mayday is an awesome indie market with a TON of awesome vendors. Somehow I managed to keep my own spending in check. I don't know how... it took a lot of restraint. After looking through the Mayday vendors, I knew I had to find The Knotty Owl ASAP. So, after setting up my own booth, I quickly wandered the market looking specifically for TKO. And I wasn't disappointed! TKO is the work of industrial designer/woodworker/jewelry maker, Ashley Landon. Each piece of jewelry that artist Ashley creates is hand-cut and assembled with great care and attention to detail. I could have easily spent hundreds of dollars, but limited myself to a pair of minty green owl earrings. I love that Ashley makes post earrings... I feel that a lot of jewelry makers ignore us post lovers and gravitate toward dangley, which are fun looking, but not so fun for those with sensitive ears! So thanks Ashley. I really wanted to buy one of her spirit animal pins [the deer shown below] but didn't. Once her shop reopens on etsy, I'll probably splurge. Hopefully she'll make it into a necklace too! And there's always Mealy Monster Land. I met Nicole Johnson, monstermind of Mealy Monster Land back in 2010 at winter show. That's when I bought my first monster... and my collection has grown since then. I need a lot of self control since Nicole and I do a lot of the same shows and I find a new favorite that I want to buy each time! Nicole sculpts all her creatures out of polymer clay. My favorites are the brightly colored monsters. They have the best expressions. Even though they are monsters, and a little scary looking, their faces always look like they're the ones that are actually apprehensive. I love that the bigger ones are clinging dolls or teddy bears as a security blanket. They're great. She makes creepy dolls and zombies too, if you're into that kind of stuff. All in all, it was a great weekend. I'm already excited for the Winter Mayday which, for the first time, is going to be two days! I hope I get in! Until then, my next show is the "Love Your Mom and Pop Vendor Marketplace" on May 18th at the Tri-Main Building at 2495 Main Street in Buffalo, NY. It runs from 10am - 4pm. Hope to see you there! Thanks to everyone who stopped by my booth at the Buffalo&apos;s 10th Annual Music is Art festival yesterday! It was a nice, cool almost autumn day. With so much to see and do, I&apos;m glad so many monsters were able to find good homes. Almost all these guys found homes! I tried to keep busy knitting because next Saturday I&apos;m back at the waterfront for another Saturday Artisan Market. So much to do! And knitting takes time! Thanks to all my friends who stopped by and especially to Grace and Josh for helping pack up! Thanks again to everyone who came out to the waterfront today! Many monsters found new homes. This is great news for me because now I have a reason to make more. I'd make more anyway, but it's fun to see people fall in love with their monster friend and take one home. Here's a shot of the monsters. Yep, they were on TV again tonight! And yes, I'm dorky enough to sit there with my camera to take a picture of them! The next show is August 11th. Same time. Same place. Come on down. Well, hi! That was one crazy weekend! Erinmakesstuff managed to be in two places at once! Let me start off with a huge THANK YOU to everyone who came out to support the UUCB Holiday Show in Buffalo and the Indie Garage Sale in Utica. SO MANY monsters found homes. There is hardly anything left in the bin! I would definitely do both shows again... but hopefully they don't happen on the same day next year! That was a wee bit STRESSFUL! Sitting at these shows reminds me why I make these guys. Sometimes when I'm working I think, "What am I doing?!" Knitting is super time consuming and I'm probably crazy for picking that technique. But watching the "journey of emotions" on customers faces is priceless. [My friend Allison said that yesterday and I liked it.] It's rare for someone to not crack a smile, even if at first glance they seem puzzled. And that's all these monsters need to do: make you smile. Cheer you up. Laugh. Enjoy. They are as warm and cozy as your favorite sweater and each has a personality all their own. What more do you need? To sweeten what was already an awesome weekend, I learned something else! The Utica O-D newspaper used pictures of my monsters with their article to advertise the Indie Garage Sale! On Saturday customers were passing by and kept commenting that they saw my stuff in the paper... and I had no idea what they were talking about. Fortunately my friend [and wonderful host! Thanks again Susan!] was able to dig through her parents recycle bin Sunday morning and find me a copy! Monsters were pictured on BOTH the cover and inside the Thursday weekend section! How cool is that! Pictured in the paper in two cities for two different shows within two months! [And both times I had no idea!] At least this time I managed to get a copy of the paper! To end this post, THANK YOU to the wonderful people at the UUCB in Buffalo. I'm sad I couldn't be there in person this time. Everyone who went said it was fantastic so congrats on a job well done!